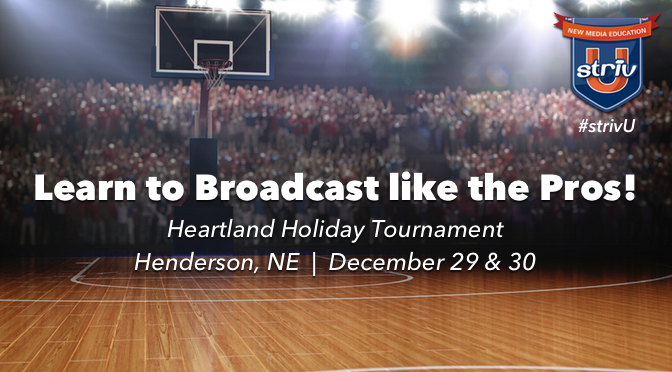 Sign up below to join us at the StrivU Broadcasting Workshop during Heartland Holiday Tournament on December 29 & 30. We’ll be providing specific details in the coming weeks. What role best fits you? Color Commentator – The color commentator will announce going to a commercial break and give stat reports of the games & teams. Director – The Director will call the shots and communicate with everyone on the team. Master Control Operator – The Master Control Operator will follow the directors requests. Play-by-Play Commentator – The Play-by-Play Commentator will be the main commentator for the show, but will call on the Color Commentator for commercial breaks and when needed. Side Line Camera Person – The Side Line Camera Person will stream the huddles, coaches, side line interviews, and crowd. Side Line Reporter – The Side Line Reporter will interview some of the coaches and players. Stationary Camera Person – The Stationary Camera Person will be focused on streaming the game unless called to do something else by Director.